Top winners in America’s big league of little entertainers, the non-profit American Kids Inc., local talent competition held recently in Guymon represent Forgan, Guymon, Leedy and Texhoma, Okla., and Liberal, Kan.
Sydney Mathews of Forgan placed gold with honors in country vocal and musical theater and took gold in the gospel, serious and popular vocal categories. Mackenzie Helm of Guymon was awarded gold with honors in gospel, serious and popular vocal categories and received gold medals in country and musical theater vocal categories. Jordan Urban of Liberal, was presented gold for her musical theater and popular vocal entries and silver medals in country, gospel and serious vocal. Holly Barrow of Leedy earned silver in country, gospel and serious vocal. Randi Yates of Texhoma placed silver in country, gospel and popular vocal. Radleigh Bauer of Guymon won a silver medal in country vocal. 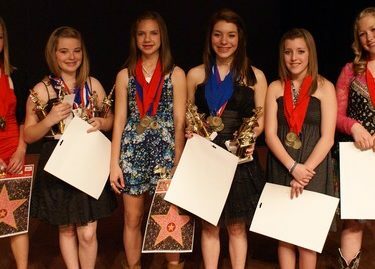 The young performers qualified high enough in their talent categories for state competition with a goal of qualifying for nationals. Oklahoma State Finals will be held in May in Bethany, according to Clarence Moore, Oklahoma Kids state director. At state, the kids will be eligible to qualify for the national competition to be held in Branson, Mo., this summer. National competition traditionally concludes with an All Star Show at which the top act wins $1,500. The Guymon event was coordinated by Wendy Keith, local director and Oklahoma Kids alumna, as part of Epic Saturdays, a full calendar of fun community events, is a team effort between Epic PCS and Main Street Guymon and includes a wide range of happenings from athletic and active to educational and entertaining. Keith has been working the few years coordinating Oklahoma Kids, Kansas Kids and Texas Kids. All three states and more were invited to participate in the preliminary event. Keith will be organizing performances in the area for the young performers in addition to the membership competition. Keith may be contacted at 580-206-1899. American Kids Inc. is celebrating its 29th anniversary in 2011. American Kids is different from other competitions in the performance opportunities given the group’s membership outside of the competition, according to Moore. "Our members, with guidance from our certified adult volunteers, present a vast number of shows on the local, regional and national level to share their talent gifts for the benefit of others," he said. For more information call Moore at 918-512-8044 or go to the Oklahoma Kids website at oklahomakids.us or the national website at americankids.com.